What's LED Bazaar all about? Rapidly evolving regulations governing emissions and safety, as well as technological disruptions such as connectivity and e-mobility, could lead to increased demand for electronics in the automotive sector. In India, the electronics content is expected to account for nearly 45 per cent of the total cost of an automobile by 2030. Much to the relief of exporters, the government has extended three key export schemes till March 31, 2020. What is needed, however, is greater clarity on long term schemes and policies, as year-on-year extensions give exporters comfort only for a limited time period. Is design the new gold mine for distributors? The service that electronic component distributors have provided over the years has changed very significantly. Nowadays, distributors help customers in meeting many of the requirements for developing, designing and manufacturing products as well. Looking at the critical need customers have for design in electronics, distributors have started setting up their own in-house design teams. This article looks at how leading-edge innovation and electronic component technologies are supporting advanced smart home security and monitoring solutions. All business processes need to be future-proof and adaptable when dealing with technological advances. Many businesses are already using the Internet of Things (IoT). As the technology becomes more and more integrated into our lives, business processes will have to continue to adapt. soldering tools for different types of soldering jobs and temperatures. "We hope that our distributors are not only capable of promoting sales, but also of helping with technical support when required"
The T&M space in India is witnessing considerable growth with many test and measurement instrument producers showing an interest in setting up offices and engineering units in the country to cater to the growing demand. In this interview, Eliza Chang, marketing director of ITECH Electronic Co. Ltd, shares the company’s strategies for the Indian market with Baishakhi Dutta of the EFY Group. Automation is the next big industrial trend that will drive factories and production units. But a lot of questions about unmanned factory floors are yet to be answered, such as what will the capex and opex of such technologies be or will there be any major trade-off associated with such investments? 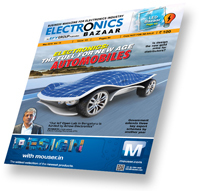 Baishakhi Dutta of the electronicsforu.com network speaks with Soni Saran Singh, executive director of NMTronics India Pvt Ltd, to get the answers to these questions. Smart meters are being actively promoted by government bodies in order to change the power sector ecosystem. They come with a host of benefits for consumers as well as energy suppliers by reducing data entry costs, eliminating meter reading, and cutting down the quantum of commercial losses and the billing inefficiencies. Are you investing in the latest dispensing, coating and curing equipment? Printed circuit board (PCB) components require various types of equipment for different procedures, such as dispensing, coating and curing. During batch operations for mass production, all the three activities go hand in hand. Hence, staying updated with the latest machinery is a must, in order to ensure quality production. "Our IoT Open Lab in Bengaluru is funded by Arrow Electronics"
There’s a vast range of enclosures available for LED lights, aimed at both home and industrial settings. These housings are usually focused on component-specific mounting solutions, attachment methods or additional security features for a particular type of application. Read on to learn more about them. Energy Efficiency Services Ltd (EESL) has transformed the lighting sector, saving 8.3GW of power by initiating the massive switchover to LED lighting.